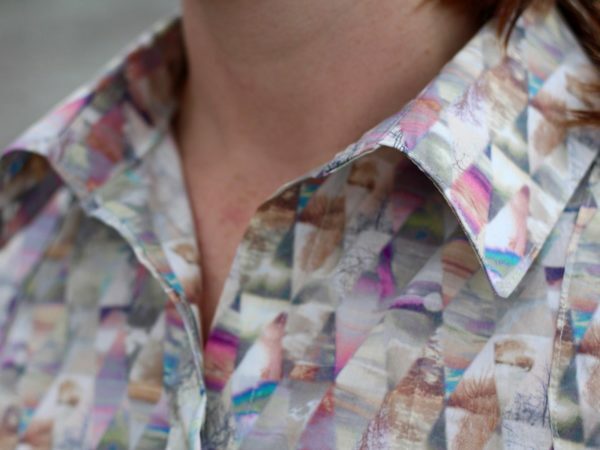 This shirt is a bit of a departure for me, both in terms of what I normally wear, but also in terms of what I normally sew. I don't tend to wear many button-down shirts, because, if I'm because brutally honest, I really can't be bothered to pick up an iron outside of when I'm sewing! And I don't usually wear prints outside of activewear, and certainly not Liberty ones (way too twee for me!). 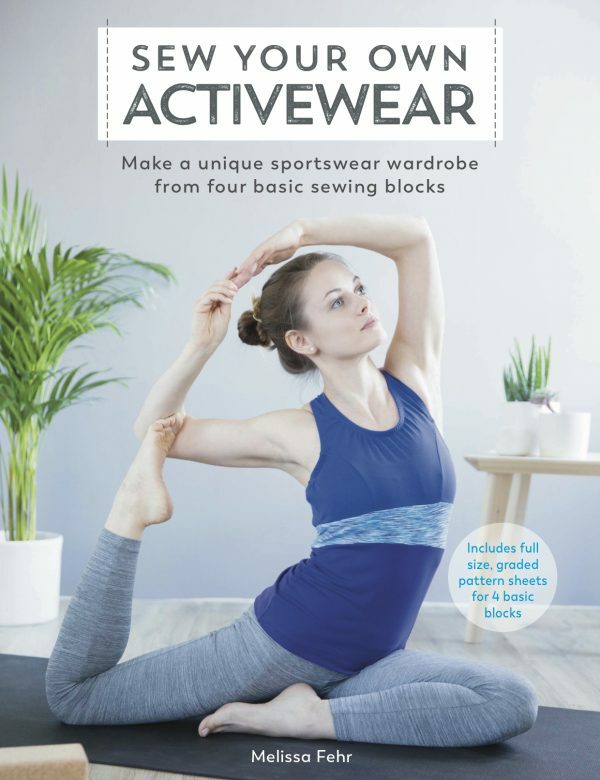 But a few weeks ago, I knew I had the Sewing Weekender coming up and I wanted a project to take along for the open sew session that didn't involve an overlocker (since there'd be only two for 50 sewists) and that wasn't anything close to the Work Sewing I'd been doing so much of recently. This shirt is a bit of a departure for me, both in terms of what I normally wear, but also in terms of what I normally sew. I don’t tend to wear many button-down shirts, because, if I’m because brutally honest, I really can’t be bothered to pick up an iron outside of when I’m sewing! And I don’t usually wear prints outside of activewear, and certainly not Liberty ones (way too twee for me!). 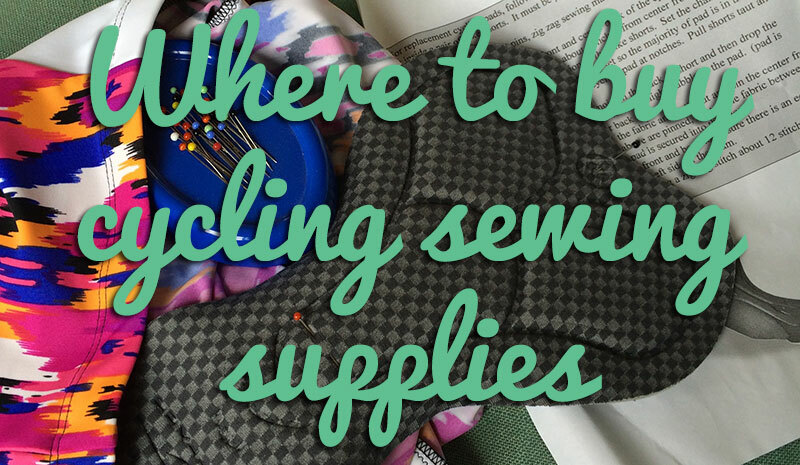 But a few weeks ago, I knew I had the Sewing Weekender coming up and I wanted a project to take along for the open sew session that didn’t involve an overlocker (since there’d be only two for 50 sewists) and that wasn’t anything close to the Work Sewing I’d been doing so much of recently. 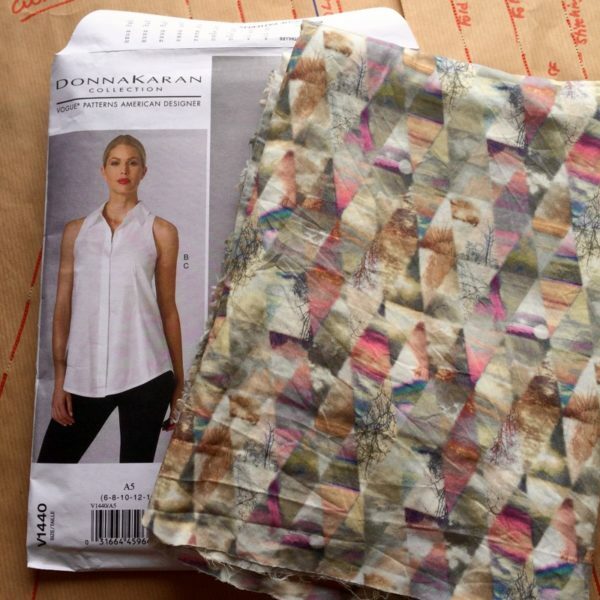 So I pulled out this Donna Karan (Vogue 1440) pattern which I’d loved and bought the second it was released (highly unusual for someone like me who only buys a few envelope patterns a year!). But I just fell in love with the cutaway back view on the shirt, and knew that Donna Karan’s designs are always interesting to sew, having made several dresses and trousers of hers in the past. Alas, all Donna Karan & DKNY Vogue patterns are now OOP due to a licensing change with her new ownership at the label, so I’m afraid it’s a seller’s market if you want to make one for yourself now! I paired it with the “least Liberty-looking” Liberty lawn which I’d bought with gift coins a few years ago and had been patiently sat waiting in my stash ever since. Thankfully the 1.5m I’d bought at full price ended up being enough for this top, with a few bits leftover destined for trouser pockets and waistband linings! 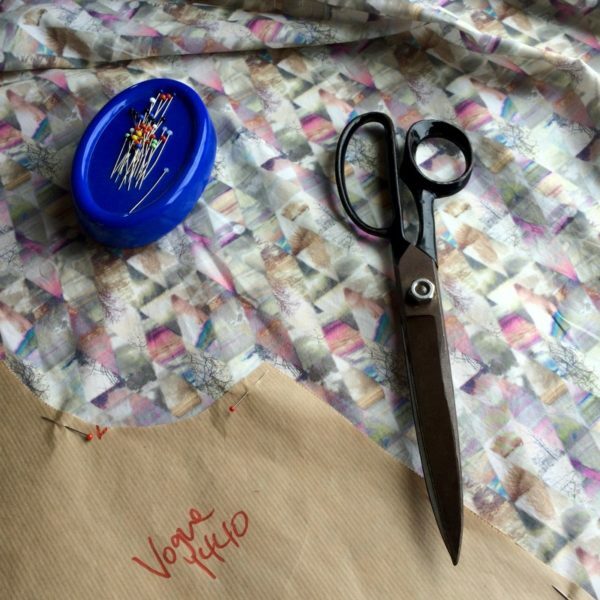 Now, onto the pattern – I am really glad I made a muslin before cutting into my Liberty lawn. All the reviews I’d read said that this pattern runs really big in the body, so I was expecting that. It also ended up being waaaay too long on me (halfway down to my knees, and I’m 5’8″! ), plus the top button placement was scandalously below my bra band. But the shoulders and bust fit me really well (having already gone down a size), and the underarm was plenty high enough for me, unlike some other reviewers. So I started by chopping off about 6 inches from the hem, which actually made the top feel less like a circus tent and more like a roomy top! I also added another button placement a few inches above my bust, but ended up keeping the darts as-drafted. As with most Donna Karan patterns, the construction on this is largely counter-intuitive, with facings applied to the outside and lots of French seams to create a very clean interior. 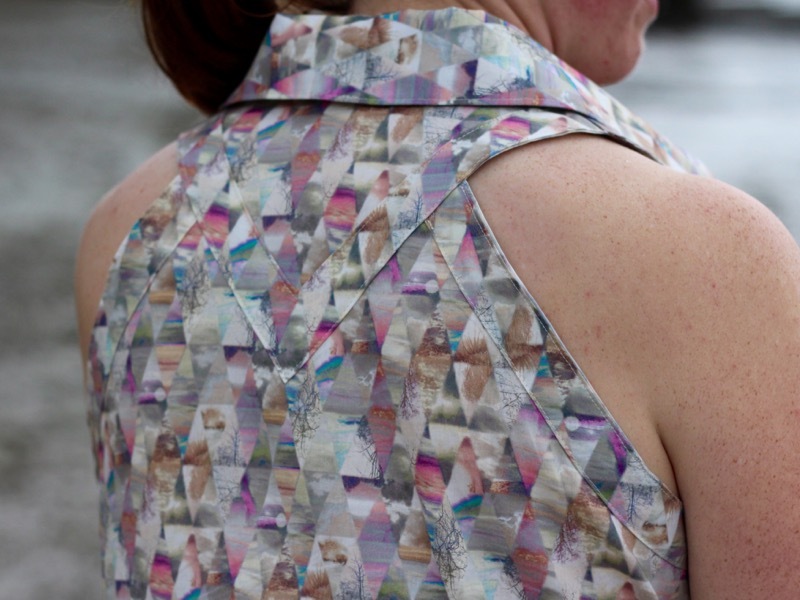 This makes for a wonderful finished garment, but it does mean you can’t “switch off” as you sew, and it made for a bit of unpicking while at the Sewing Weekender, while I was distracted by talking to people! I had planned ahead, however, and sewn a lot of the fiddly and/or iron-intensive parts at home before I left – like constructing the concealed button placket, sewing the buttonholes, making and topstitching the collar, and pressing all the seam allowances under on the many exposed facings – so that most of what was left for the Weekender was assembling the parts. Despite not wearing many button-down shirts, this actually isn’t the first time I’ve sewn a concealed button placket (I can thank a random Burda magazine pattern for that!). But the instructions for sewing the placket in this patterns were c-r-a-z-y with lots of unnecessary hand sewing that literally got folded and sealed up inside in the next step! So for me, making the muslin was an exercise in crossing out lots of hand stitching steps in the placket construction. I’m all for hand sewing when there’s a purpose for it, but there was literally zero point in the hand stitching here. 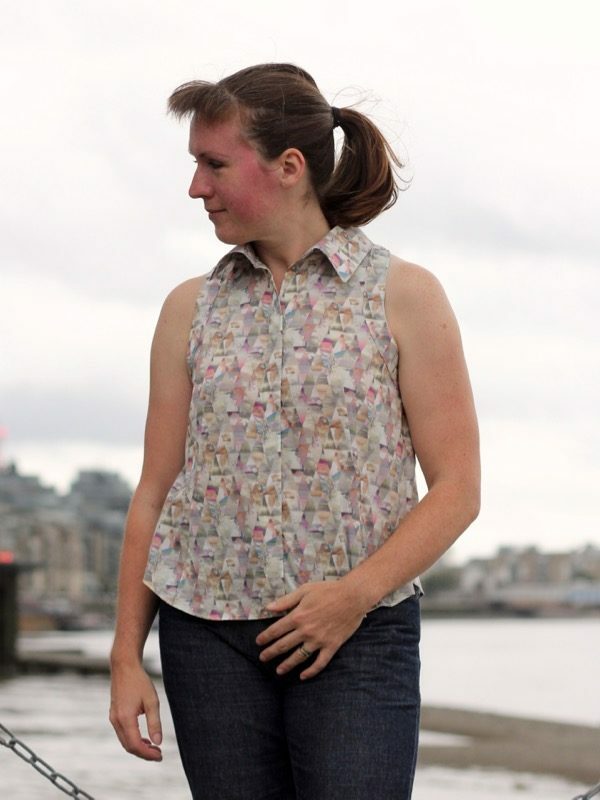 One of the best reviews I’d read of this pattern came from Kay the Sewing Lawyer, who had a lot of clear recommendations, both on fitting changes but also for an alternative order of construction to make a neater shoulder seam finish. I ended up following hers for the final shirt, but to be honest, I’m not convinced that this way actually provides a better result, as I still had some ugly, uneven parts at the shoulder that I had to neaten up with hand stitching. So I think next time I’d keep the general order unchanged from the instructions. Oh, and the other change I made was in finishing the hem! 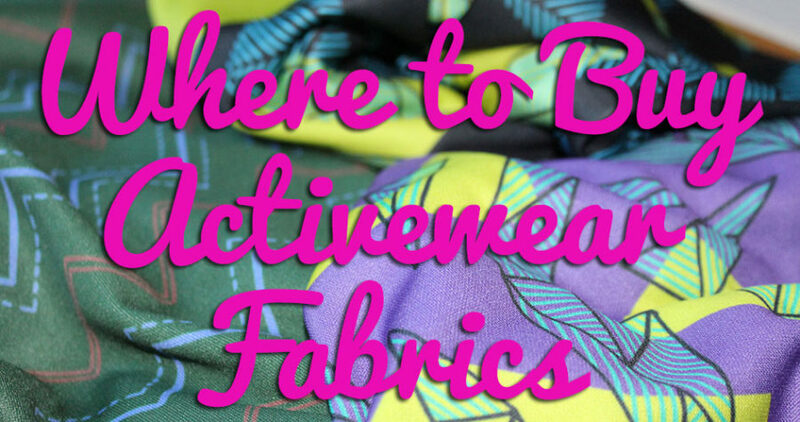 The original pattern calls for a bias facing on the hem, which was a total fabric hog! And since I cut so much off the hem after my muslin anyway, I’m glad I didn’t bother to trace off that pattern piece as the length and notches would’ve been totally irrelevant. Instead, I just did a narrow, two pass hem (press under 1/4in and edgestitch; trim close to stitching, press under and edgestitch again) which keeps the hem light and inconspicuous, and better for tucking into skirts should I wish to. But lets take a better look at the real star of this pattern – that back inverted triangle and cutaway shoulders! It’s further accentuated by the applied facings on both the V and the armholes, and really, the only downside here is that I have to wear a strapless bra with this shirt (as I don’t have any non-sporty Y-back bras). From first glance, the collar and stand look pretty standard, but I like that it’s meant to be worn open in a casual style with no top button, which gives this shirt yet another selling point! 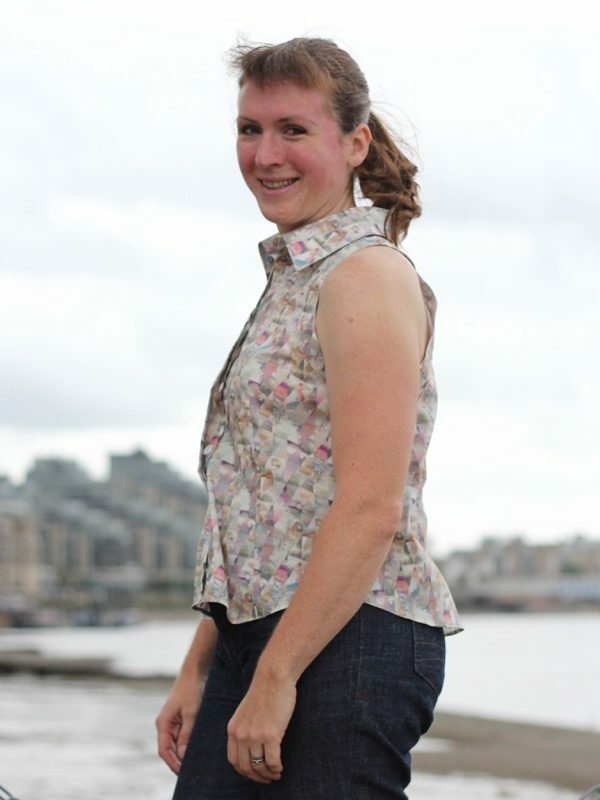 All in all, I absolutely love this shirt (even under windy conditions like at our moorings when we took these photos!) and would totally make it again. 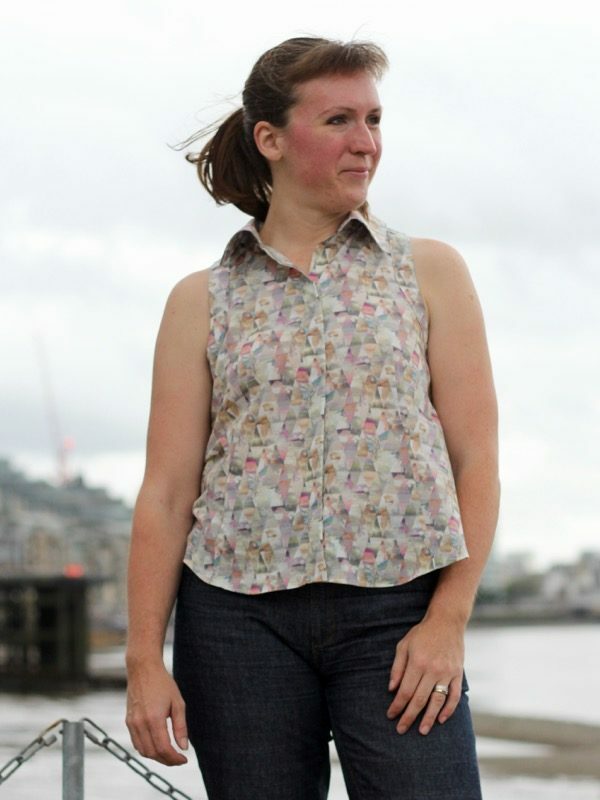 It’s as fun to wear as it was to sew, and I got so many compliments on it when I wore it out to the pub at the Sewing Weekender. 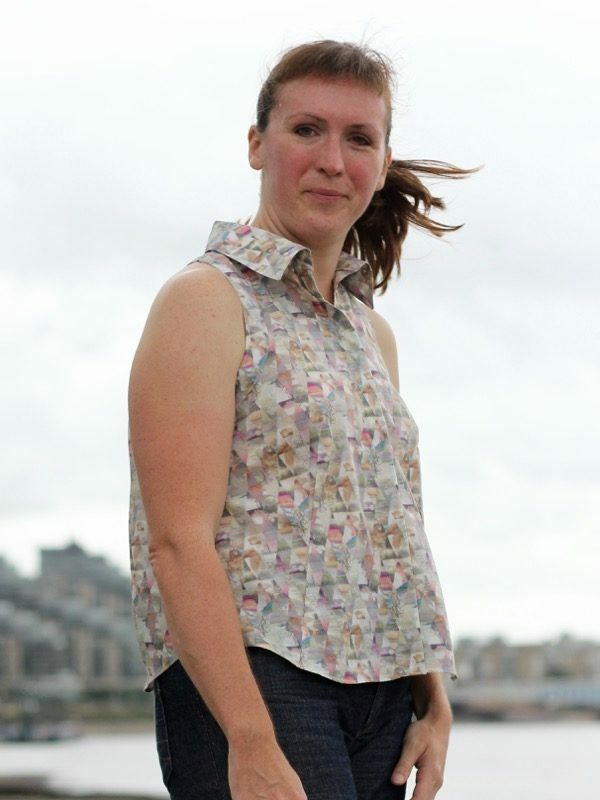 Separator image Posted in Gallery and tagged with cotton, designer, top, vogue. Love this shirt on you. The liberty is soft on your skin too. I too bought this pattern immediately although I have not yet tackled either project. 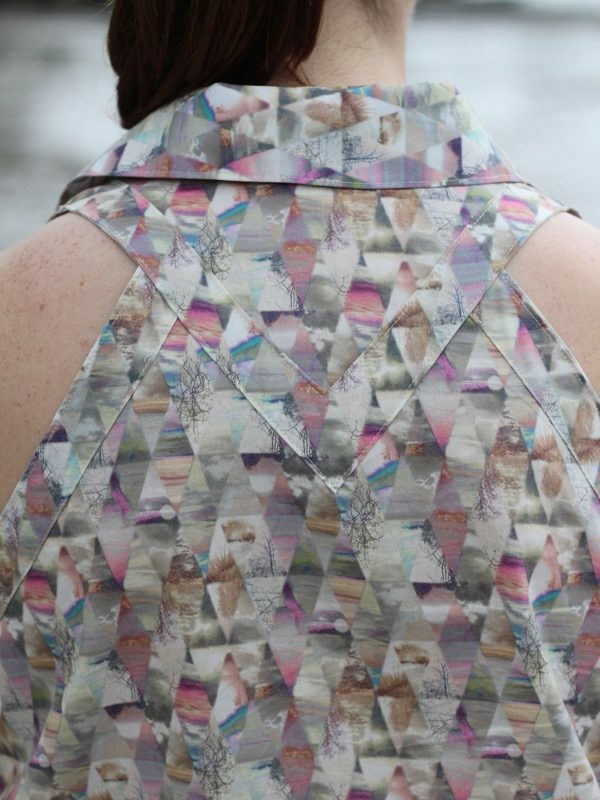 Your fabric looks perfect for it and the back design is fabulous. I understand about sewing retreat distracted sewing so your unpicking line made me giggle. I’ve learned not to take a new project to cut out at retreat for exactly that reason. I love the back details. 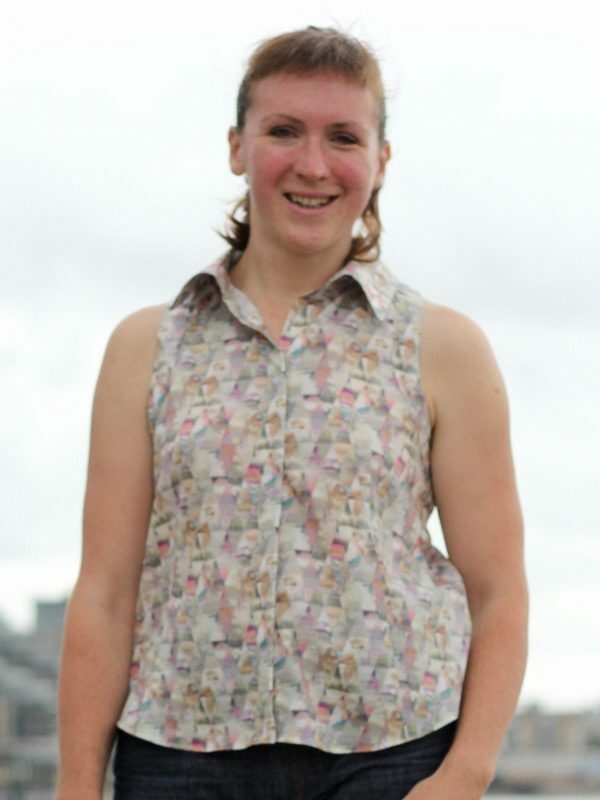 A really lovely shirt Melissa. I missed buying the pattern so will be drafting something similar for myself. 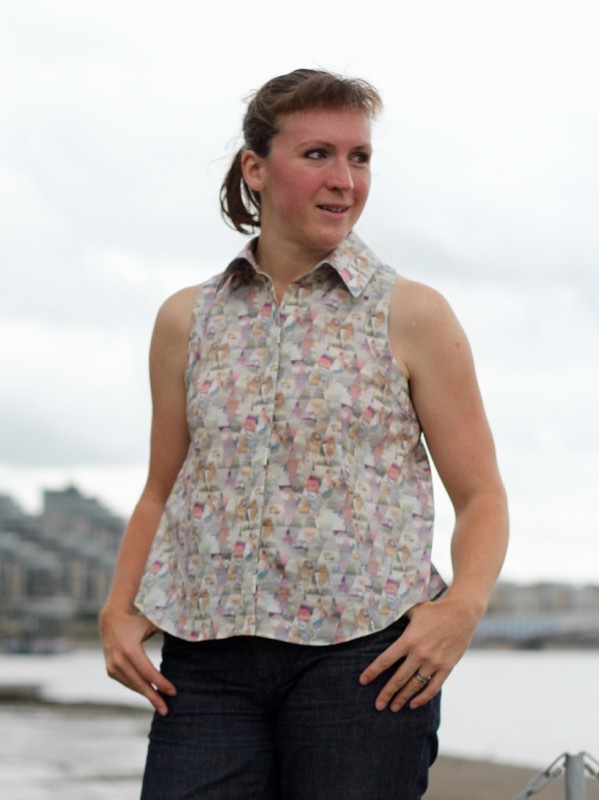 The fabric is gorgeous – a Liberty that doesn’t look like typical Liberty. Wonderful. I would love to buy this pattern.